A sequel worth going Ape for? Summer 2011’s Rise of the Planet of the Apes (directed by Rupert Wyatt) proved a successful revitalisation and reinvention of a classic science fiction film franchise. A surprise critical and commercial hit for studio 20th Century Fox it was a case of “if at first you don’t succeed…”, granted it took over a decade for a second attempt (following the poorly received Planet of the Apes ‘reimagining’ from director Tim Burton) but well worth the wait. The new Apes franchise was already off to a good start and the saga’s second chapter, Dawn of the Planet of the Apes managed to live up to the hype and the wave of positive opinion that emerged from the film’s theatrical release earlier this year – where it grossed over $700m at the box office. It’s a sequel that builds upon the creative and narrative foundations of the excellent Rise of the Planet of the Apes, bettering it on every level as every sequel should, yet rarely achieves. Moving events a decade on from the closing frames of Rise, Dawn of the Planet of the Apes allows us to see an evolving and growing ape society living a peaceful (at times fractious) existence under the leadership of the elder, more seasoned Caesar with loyal allies Koba, Maurice and Rocket still at his side. Believing that all of humanity has succumbed to the Simian Flu, the ape society’s security is threatened when, by chance, human survivors are discovered. With a human colony desperate to utilise a nearby dam to provide them with power, a reluctant and uneasy alliance is formed and deceits eventually bring both groups to the brink of war. 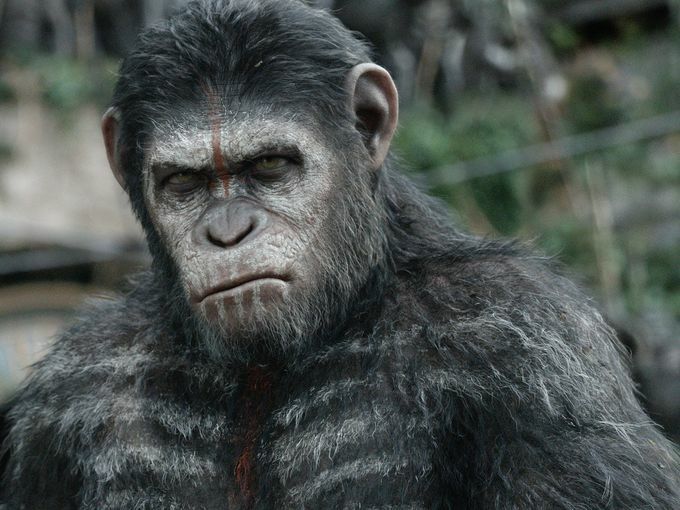 Dawn of the Planet of the Apes is obviously a visual marvel – much as Rise was upon release – made possible by the continuing refinement of digital effects and motion capture technology. It’s all handled capably by director Matt Reeves who is no stranger to large scale environments and the demands of a multi-million dollar effects-laden project, having cut his teeth on the J.J. Abrams-produced Cloverfield. Yet there’s much more to Dawn beyond its visual aesthetics and technical accomplishments. This is a film with dramatic and narrative weight with some great and well defined characters – both ape and human. Andy Serkis once again proves that motion capture performances are just that – beneath the digital exterior lies expressions of thought and emotion that truly make the ape characters believable and Serkis is arguably at the forefront of it all. Gary Oldman gives another reliable turn as Dreyfus, the emotionally tortured leader of the human survivors, but Caesar’s true counterpart lies in Jason Clarke’s Malcolm, a man who he finds holds similar values of family and society. One of Dawn’s biggest draws however is the rebellious and volatile Koba, brought breathlessly to life by Toby Kebbell with a performance that is truly electrifying (and at times terrifying) and adds further weight to that believability of these characters. Along with Sirkis, he is an incredible talent and a joy to behold. That’s what is most enjoyable about Dawn of the Planet of the Apes, amongst some of the more comfortable ‘by the numbers’ popcorn blockbusters that were also released this summer, it is a film with not only spectacle, exciting set-pieces and jaw-dropping effects but a laudable measure of heart and soul as it explores themes of family and survival and brains as it conveys a narrative that is beyond a mere case of ‘good’ apes versus ‘bad’ humans. Just like the original Apes franchise explored these themes of society and the human condition, so does Dawn of the Planet of the Apes. The bottom line: Dawn of the Planet of the Apes is a strong contender for film of the year, beyond its incredible technical achievements it has a resonance and depth that many other summer blockbusters fail to accomplish. Not to be missed. Dawn of the Planet of the Apes is available on Blu-ray, DVD and digital download now. The incredible Andy Serkis brings the Ape leader, Caesar to life in 20th Century Fox’s spectacular ‘Dawn of the Planet of the Apes’. What are your thoughts on Dawn of the Planet of the Apes? Leave your comments below! In 1968, Stanley Kubrick (with Arthur C. Clarke) took audiences on “The Ultimate Trip” with 2001: A Space Odyssey – a cinematic experience widely considered as the apex of cerebral and imaginative science fiction. It proved triumphantly that science fiction cinema could be realised in a serious, thought provoking and technically proficient manner – a world away from the plethora of cheap (though in many cases, still enjoyable) ‘popcorn’ B-movies of the 1950s. With Christopher Nolan at the helm, Interstellar follows Kubrick’s lead and melds the expansive imaginings of 2001 with human drama and exploration of modern scientific theory. Nolan’s first post-Batman work is more Inception than The Dark Knight Rises, offering more of the reality altering and mind-bending imagery achieved in the former than the intense comic book action of the latter – though that’s not to say that Interstellar doesn’t include a fair share of edge-of-the-seat moments, it simply balances them against its other diverse elements. Interstellar introduces an Earth that has been environmentally decimated, with humanity having turned its back on technological and other pioneering pursuits in favour of sustaining a desperate existence. McConaughey plays Cooper, a widowed father of two and a former NASA pilot who once pondered about humanity’s place in the universe and forced to give up his dreams to take up a life as a humble farmer – dreams that have sparked the imagination of his daughter, Murph (Mackenzie Foy). Unexplained events lead Cooper and Murph to a chance meeting with Professor Brand (Michael Caine) and the hard, but necessary decision Cooper decides to take by leaving his family to join an interstellar mission through a recently discovered wormhole to find humanity a new home – before it’s too late. Whilst Interstellar generally takes the ‘hard SF’ route of 2001, there’s actually a surprising amount of emotional depth to proceedings played primarily via Cooper’s relationship with his daughter and her despair at her father’s decision to leave her (and her bother) behind to embark on a journey from which he may never return. At turns heart-wrenching and heart-warming it provides the story with a resonance and a humanity that sets Nolan’s film apart from 2001 and ventures closer to the likes of Steven Spielberg’s Close Encounters of the Third Kind. Naturally, Interstellar presents us with Nolan’s customary ‘heightened reality’ and the hard SF route is taken via the scientific theories of wormhole and space-time postulated by physicist Kip Thorne and as a result there is some heavy exposition that may leave traditional blockbuster audiences jaded and perhaps threatens to distract the more learned viewer, therefore it is the afore-mentioned emotional core that Nolan employs deftly to seek a balance between the intellectual moments and the human drama. Nolan has once again assembled a fine cast of actors who successfully infuse their roles with the awe and wonder that the journey of Interstellar demands of them, juxtaposed against that human drama and presenting high stakes and challenges for their characters to dare to overcome. McConaughey continues his resurgence of recent years, bringing a likeable and relatable quality to Cooper who is both a striving pioneer straight out of The Right Stuff and loving father struggling to reconcile with the anguish of leaving his family behind for the ‘greater good’. Similarly, Hathaway puts in another strong performance as scientist Amelia Brand, who also has her own personal grief to bear. Among other casting highlights are the ever reliable (and Nolan regular) Michael Caine who makes good use of his relatively small screen time as Amelia’s father, Professor Brand, some well-placed levity from droid ‘crewmember’ TARS, voiced by comedian Bill Irwin and a surprise cameo from…a well-known actor. 2001 aside, Nolan has cited a variety of influences that are present throughout Interstellar – from the world-building of Star Wars to the worn ‘lived-in’ aesthetics of Ridley Scott’s Alien, enriched by a commitment to practical elements of set design and location shooting (boasting some striking photography by Hoyte Van Hoytema which demands the extra cost of an IMAX ticket). It’s an ode to the genre and the overall possibilities of good, practical, film making in the digital age. Hans Zimmer complements the visual and emotional elements with another wonderful, wondrous, score (can he do any wrong after his incredible compositions for Inception, The Dark Knight Rises and the Nolan-produced Man of Steel? ), although there are moments where the sound mix seems to be out of balance as Zimmer’s music threatens to muffle some of the dialog – hopefully this will be rectified for the home video release. Despite grand intellectual themes and incredible imagery, Interstellar provides a decent measure of excitement with a number of set-pieces to rival Inception, with the colossal tidal wives and ice clouds of the worlds the film’s characters voyage to and a particularly tense, edge-of-the-seat orbital docking sequence among the highlights. True, some may find the near three hour running time challenging (and at times it does verge on that feeling) and those not familiar with Nolan’s previous works or appreciative of the cerebral SF of 2001 might be baffled by the mind-bending final act but for fans of such things, Interstellar is bound to delight and inspire. Interstellar is in cinemas now. Cooper (Matthew McConaughey) embarks on a journey to save the human race in Christopher Nolan’s ‘Interstellar’. 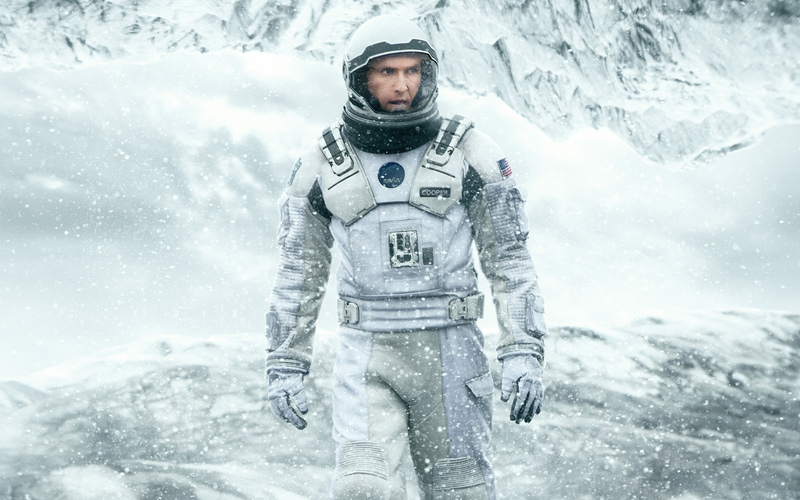 What did you think of Interstellar? Share your spoiler-free thoughts below! Based on his book by the same name, director/co-writer Stephen La Riviere’s feature-length documentary presents a fascinating and in-depth look at the birth (and eventual decline) of the numerous iconic British children’s television series created by Gerry & Sylvia Anderson during the 1950s and 1960s. That the various series were produced during those periods doesn’t really matter as thanks to television re-runs and home video releases during the 1980s, 1990s and 2000s they have captured the hearts and appreciation of children (and adults) generation after generation. ‘Hosted’ by Parker and Lady Penelope (with voice artists David Graham and Sylvia Anderson reprising their respective roles from Thunderbirds), Filmed in Supermarionation features newly recorded interviews from surviving Anderson collaborators including co-creator/producer/voice artist Sylvia Anderson, puppeteer Mary Turner, director David Lane and voice artists David Graham (Supercar, Thunderbirds), Shane Rimmer (Thunderbirds) and Matt Zimmerman (Thunderbirds). Sadly, Gerry Anderson himself passed away in 2012 but thankfully La Riviere’s documentary incorporates footage from an extensive archive interview without which the documentary would be sorely lacking. Filmed in Supermarionation provides an overview of the various Anderson puppet-based series from conception to production and a look at the evolution of the puppetry and progression in effects technology and production values with each subsequent series, from humble yet accomplished beginnings in the late 1950s with Four Feather Falls and Supercar to the true birth of the ‘Supermarionation’ format in the early 1960s with Fireball XL5 and Stingray (the first Anderson series to be filmed in colour) to the huge global success of Thunderbirds in 1965 and beyond. Even with a 2 hour running time, there’s an awful lot of ground to cover and if there’s any real flaw to Filmed in Supermarionation it’s that some elements are not dealt with as extensively as others. There is heavy focus on the production of Thunderbirds, which is understandable as it’s the most iconic of all Anderson series and widely regarded as the pinnacle of his success yet it’s a shame that so little time is spent discussing subsequent series Captain Scarlet and the Mysterons (particularly as this introduced the more life-like and correctly proportioned marionette design) and even less on Joe 90 and the final Supermarionation production, 1968’s often overlooked The Secret Service. It’s also disappointing that although there is significant discussion of the ground-breaking model work and special effects from effects director Brian Johnson, there is only some brief archive interview footage of effects supremo Derek Meddings. That being said, Meddings’ contribution to the television and film industry is rightly acknowledged and Johnson does demonstrate the secrets behind some of the visual trickery employed when creating the action and model effects sequences for the likes of Thunderbirds et al. Despite some of these minor flaws, Filmed in Supermarionation is still a well-produced and extensive piece of nostalgia via it’s mix of newly recorded interviews (and ‘scenes’ featuring Parker and Lady Penelope) and archive interview footage as well as footage from the actual series themselves that re-affirms the iconic stature of the worlds of Gerry Anderson. The bottom line: Filmed in Supermarionation is an intriguing and nostalgic look at the creation of some of the most-loved and iconic television series of all time and is essential viewing for fans of the imaginative worlds of Gerry Anderson. Filmed in Supermarionation is out now on Blu-ray and DVD from Network. ‘Supermarionation’ – a term that has forever engaged the imagination and continues to thrill audiences the world over is explored in the extensive documentary ‘Filmed in Supermarionation’. What are your thoughts on Gerry Anderson’s various ‘Supermarionation’ series? Leave your comments below!